I’m not one to complain about the hype machine; in fact, I think I like it. At least people are excited about something, right? But it’s hard to keep an even perspective when you read stories with titles like “Bryce Harper Makes Fans Dream As Big As He Does.” Thomas Boswell’s story is excellent, to be fair, but the soaring rhetoric of the title is an indication of where we’re headed — hell, where we’ve already gone — with this Harper Hype. So far, the 19-year-old Nationals rookie is doing fine, with a .267/.350/.467 line and a couple home runs. Not hype-worthy quite yet, but these things take time. But the essence of Harper so far is his personality, and he has unequivocally not disappointed in that arena. To put it very mildly, the dude is intense. Earlier this month, he smashed the Nationals dugout with his bat, a splinter of which broke off and gave him a gash (and 10 subsequent stitches) above his eye. He’s a fist-pumper and a face-contortionist. He stomps on first base after routine groundouts. He crashes into walls to make fantastic catches. He throws darts from left field. He steals home. He sparks walk-off wins with clutch hits. His unique energy and his youth, symbolized by the skullet haircut (R.I.P. ), seemed to thrust him into the spotlight even when his numbers were not spectacular. They also bred resentment. The most notable instance came two weeks ago, when Cole Hamels plunked him in the back and later admitted that it was on purpose. Hamels was just reinforcing what he called “old-school baseball,” and felt that Harper’s ebullient attitude violated that unwritten code. For his troubles, he earned a five-game suspension. But as David Brown pointed out, the beanball was also an unconventional sign of respect. Harper’s infectious energy is infiltrating the game, and people are noticing. Which is why the Hamels-Harper rematch Wednesday night felt so compelling. A scattering of boos from the Phillies faithful greeted Harper as made his way to the plate, and after working the outside corner for two straight pitches, Hamels elicited a hard-hit fly-out to the warning track in left. A sort of victory for both, in a way, on a night that Hamels would go on to dominate. In his next two at-bats, Harper walked and singled, but Hamels got him to ground out to short to end the eighth inning and preserve a 3-0 Phillies lead. There was no clear winner in the individual duel, but the panoptical view favored the pitcher. 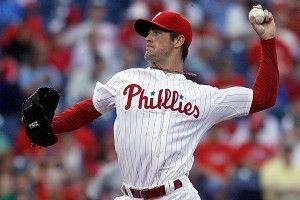 It was another masterful performance from Hamels, who shares the league lead for wins (7) and lowered his ERA to 2.17 after eight scoreless innings. He remains one of the few bright spots on the last-place Phillies. Hamels is a reserved personality, for the most part, which made Wednesday night’s outcome feel a bit anticlimactic. When a player like Harper generates conflict by virtue of his energy, it seems as though he should be dictating every step of his own journey. But Hamels’s excellence was a quiet reminder that blunt force alone will never be enough to overwhelm a sport as subtle as baseball.